Not long ago, the Barros Blancos Seventh-day Adventist School, in Uruguay, was on the verge of closing its doors for good. Due to mounting financial challenges, the Adventist Church leadership felt that several schools needed to be closed, and Barros Blancos was on the list. Elizabeth Urtazú, the principal of the school, was crushed. Turns out, the future was bright. 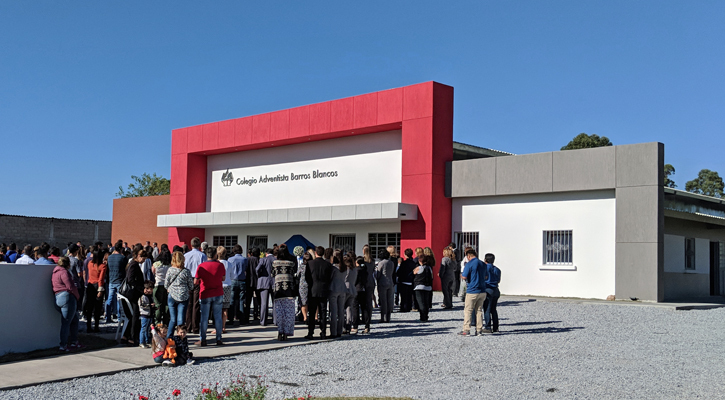 On March 14, 2018, Urtazú, along with Maranatha and leaders from the Adventist Church in Uruguay, celebrated the opening of the new Barros Blancos campus. The new school, constructed by Maranatha, has eight classrooms, along with bathrooms and administrative offices, and a central auditorium that can be used as a gym and auditorium. The new school is an answer to prayer. When Barros Blancos was under threat of being shut down, Urtazú and her staff begged for a chance to save the school. They quickly began recruiting for more students, cut a portion of their salaries, and prayed relentlessly. Their faith and hard work paid off as the enrollment climbed to 140 students. At the time, they were meeting at a local church, using Sabbath school classrooms and shipping containers for educational space. But even with 140 students, the maximum capacity for their facility, there were insufficient funds to operate the school. In order to sustain and grow the program, Barros Blancos needed a new campus. The situation was dire—not only for the school but also for the Adventist Church. Uruguay is the most secularized nation in South America and the sixth least religious country in the world. Uruguay is a tough place to grow the Gospel. The Adventist Church was established in Uruguay more than 100 years ago. But there are only about 9,000 members in the country—a relatively small number compared to membership in other South American countries. The one effective approach to reaching people with the Gospel—a way around the culture of secularism—has been education. Adventist schools have been successful in attracting children from diverse backgrounds—most of whom are not part of the Adventist church. Their parents may not be Christian, but they are interested in providing their children with a values-based education, and families are finding it in Adventist schools. Closing Barros Blancos would have greater consequences than losing an educational program. It would mean having one less center of Christian influence in the country. So Urtazú and the Adventist leadership in Uruguay reached out to Maranatha Volunteers International, in hopes that Maranatha could provide assistance. After much discussion, in 2015, Maranatha committed to build an education and evangelism center in Barros Blancos. “Dear brothers of Maranatha, you have become the greatest blessing that the church in Uruguay has received in recent years. We are deeply thankful to the Lord and to you for having decided to come and help us here in Uruguay,” said Sanchez. During 2017 and the first part of 2018, Maranatha mobilized 150 volunteers to Uruguay to help local crews with the construction project. Six volunteer teams helped to build the Barros Blancos School, including a Maranatha-led team, a team from Brazil, the Fox Valley Adventist Church Team, Detroit Maranatha Team, Oklahoma Conference Team, and West Houston Adventist Church Team. The local Adventist leadership also had architects design a facade for the entrance to the building, giving the structure added visual interest and color. At the dedication on Wednesday, hundreds attended the ceremony to watch the ribbon cutting and tour the new campus. As part of the dedication program, each student released a balloon into the sky, symbolizing how their dreams and goals can soar with education and God. Already, the kids have seen that with faith, anything is possible—even a new school.